This is the fourth DVD from the Wanderson Contract & Farm DVD series. 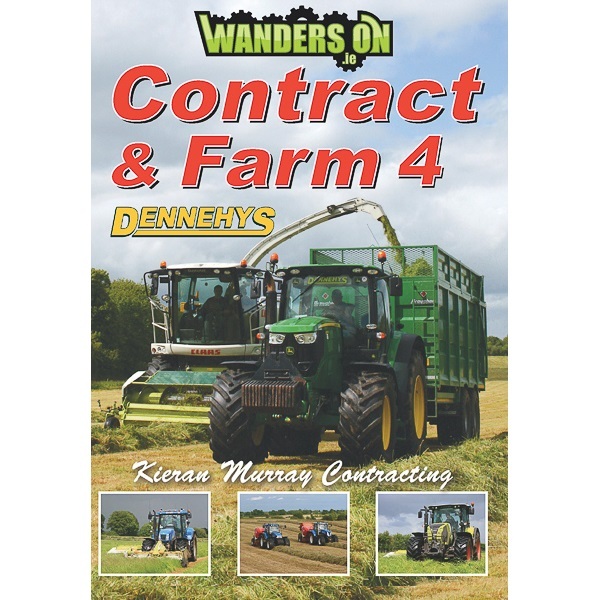 In this DVD, we follow Dennehy Contracting based near Fermoy in Co.Cork & Kieran Murray Contracting based near Athlone in Co.Roscommon. We catch up with Dennehy’s harvesting silage where they run a fleet of John Deere tractors, Broughan & Smyth trailers, Krone Triple Mowers, Claas Jaguar 940 forager & Volvo L90 loader. They use a Hi-Spec & Pichon twin axle tanker for spreading slurry. With maize season in full swing, they get a demo of the new Hi-Spec Kompactor & see its value of carrying extra maize on a long draw. Kieran Murray has a mixed fleet of New Holland & Claas tractors and we follow them hauling, mowing, baling and wrapping with their Welger balers & Tanco wrappers along with some hedgecutting. When they aren’t at grass, they have 3 slurry tankers keeping them busy throughout the year & finish up with a look at Ray’s new black edition Claas Arion 650.